I must have read a different book than he was. I also happen to like your like the line in your review: "It's worse than Katha Pollitt's recent book, Pro: Reclaiming Abortion Rights." I haven't had the misfortune of reading the book you review their, but I did have the misfortune of reading Pollitt's book. Having had the misfortune of reading Pollitt's book, I wonder if you noticed what I noticed. 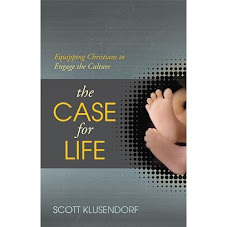 When I read her chapter on personhood, in addition to misrepresenting the position in "Embryo", it seems that her own criteria for personhood, largely consciousness and social space, don't seem to exclude human embryos (or almost any other animal) from being persons, which seems to be quite an oversight for a book of its "renown." My question is: have I read her correctly? In regard to the latter, social standing, she writes that she could be isolated on some desert island, yet, if conscious, be a person. Each one by itself seems to merely be sufficient, not neccesary to have to be a person. I don't see her making any argument that, while which one you possess is irrelevant, you must possess one to be a person; at least, this is not clearly laid out. It seems that she might hint at this when she says, 'If I lack both - say, I', on a desert island and unconscious - I won't be a person for much longer.' But it sounds as if she's saying that she'd still be a person if she lacked both attributes, but cease to be a person when she dies from exposure due to her lacking those qualities. Well, then, why isn't a human embryo a person? Or for that matter, why not a cat or a dog or a bacterium? She doesn't say. At best, to me anyway, it seems to be 'personhood is complicated and the features one must have to possess it are vague, yet the embryo doesn't have it.' Well if that doesn't convince you, nothing else she says will.